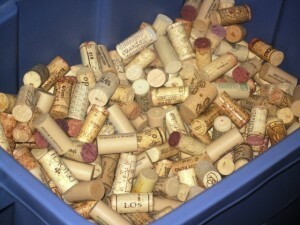 I would be very interested in knowing how many of you are into wine cork collecting? 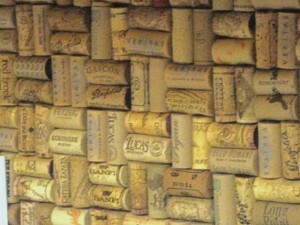 Pinterest has numerous arts and crafts ideas from wine corks. You should check it out! You will find cork floor mats, coasters, place mats, wall decor, candle holders, Christmas Tree decorations, etc. They were contemplating several ideas to use up those wine corks , but once their basement was finished, which includes a fairly spacious kitchen, they knew exactly which cork project to pursue. Yes, you guessed it….a very interesting backsplash for their new kitchen. Today I will share some pictures I took of that project, which began with my daughter’s idea, and finalized by her husband, with a helping hand from his dad. This actually turned out to be a nice family project. It all started with a special backing board attached to the wall, to outline the backsplash area. They also installed extended (protruding from the wall) electrical outlets, to allow for the thickness of the corks in the backsplash. 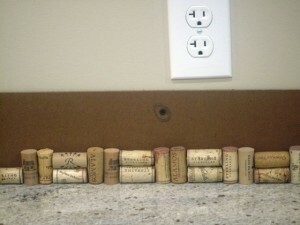 As you can see here, the electrical outlets are nicely fit on the surface of the cork backsplash. Nice job! 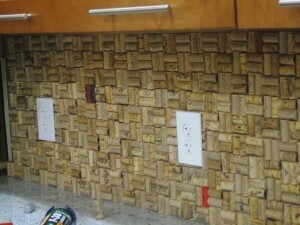 Here is a close up view of the corks, placed in a specific pattern, to create a very interesting backsplash. At last, the finished project, with lots of corks still left over…ready for another project…? 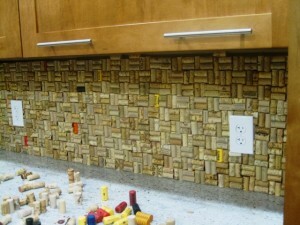 Please note, there are some color corks placed strategically throughout the backsplash, to add a little more color and character. I was very pleasantly surprised by the outcome of this project. What a great way to recycle wine corks, and be surrounded by many memories of the numerous occasions these wines were shared with family and friends. Please share your comments, plus other ideas and experiences you may have with creating interesting projects from wine corks. I love it!!! What a great idea and it turned out fabulously!! I’ve been saving corks for years as well but now most of the white wine I consume has twist caps. 🙁 boo haha! Thanks for sharing this!!! OMG… love it.!!! My plans are to use all the marble/granite wine coasters from different winerys we have purchased over the years to use as a backsplash. I want to have them randomly be part of the backsplash. Not yet sure of the design.. any suggestions? What a wonderful idea, and such sweet memories you will be surrounded with…I love it! I am sure you will come up with a super design, which will be beautiful and personal.